The region of Västergötland has been a relatively densely populated area for many ages. The fertile lowlands were easy to cultivate by the first prehistoric colonists using tools made out of stone. Many relicts and remains have been found of their presence and culture (Stone, Bronze and Iron Age). North of Skövde near Tidan lies the Askeberga Vikinggrav in the shape of a ship. It consists of 24 huge boulders and is making it one of Sweden’s largest grave sites from that period. 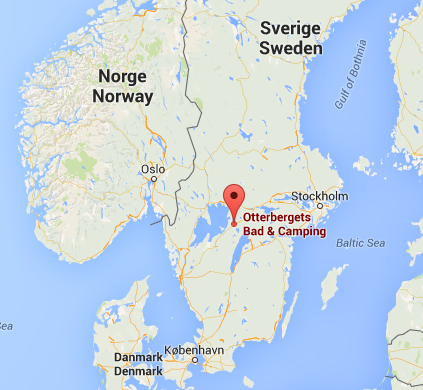 The central location of our camping site makes it easy to visit either Stockholm or Göteborg. From Töreboda you can travel by high speed train to Stockholm in under two hours giving you a unique experience. The capital of Sweden consists of fourteen islands connected by bridges. The old and picturesque centre Gamla Stan, with it’s narrow streets, has houses dating back to the seventeenth century and is well worth visiting. From the same train station in Töreboda you can travel by intercity to Göteborg in under two hours. The centre is quite compact and most places of interest are within walking distance. But you can also explore the cosy centre by making a trip on a cruise boat. Interesting places to visit are the Götaplatsen-square and the Cathedral. Hjo is a popular tourist resort on the western shore of the Vätter lake. On the border of the lake there is a walking promenade. At the end you will find a building with beautiful aquariums. 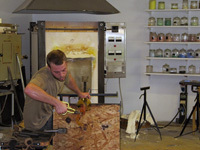 Hjo is also famous for it’s earthenware factories that you can visit. At the harbour you can eat delicious smoked fish. Another historic city worth visiting is Örebro. The most remarkable sight of the town centre is the 12th century fortification. 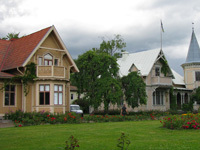 In the city park you will find the Wadköping open air museum. Here you can see houses dating back to the 17th and 18th century, small shops, a school museum and craftsmen. Södra Råda’s old church has a story of its own to tell. The old 13th century little wooden church was a unique and much valued part of Sweden’s cultural heritage. On November 12th, 2001 the church was completely destroyed by a fire. All the paintings were lost, for which the church was famous for all over Europe. But with the Södra Råda Project, started in 2002, the church is being reconstructed using tools from the period. During the months June to August there are guided tours, presentations and other activities. Läckö Slott is an imposing castle on the farthest side of the peninsula Kållandsö. The castle has 248 halls and rooms and with its unique location it is one of the most beautiful buildings in Sweden. The castle also has a wonderful herb garden. For more information: www.lackoslott.se.